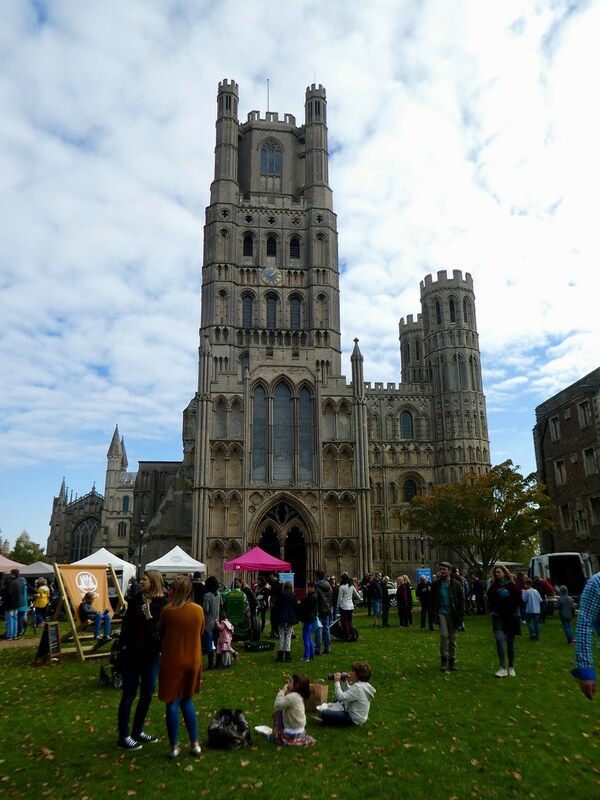 We planned to spend the day in Ely which is one of the smallest cathedral cities in England. Located just 15 miles from Cambridge, trains are frequent taking only 15 minutes with fares as low as £2.30 for an adult off-peak return. Ely’s imposing cathedral dominates the city’s skyline and it took us around 10 minutes to walk there from the railway station. Our route took us along the riverside, through the Jubilee Gardens and onto the Dean’s Meadow from where we had some splendid views of the cathedral. It is known locally as the ‘Ship of the Fens’ because of its prominent position above the surrounding flat landscape. 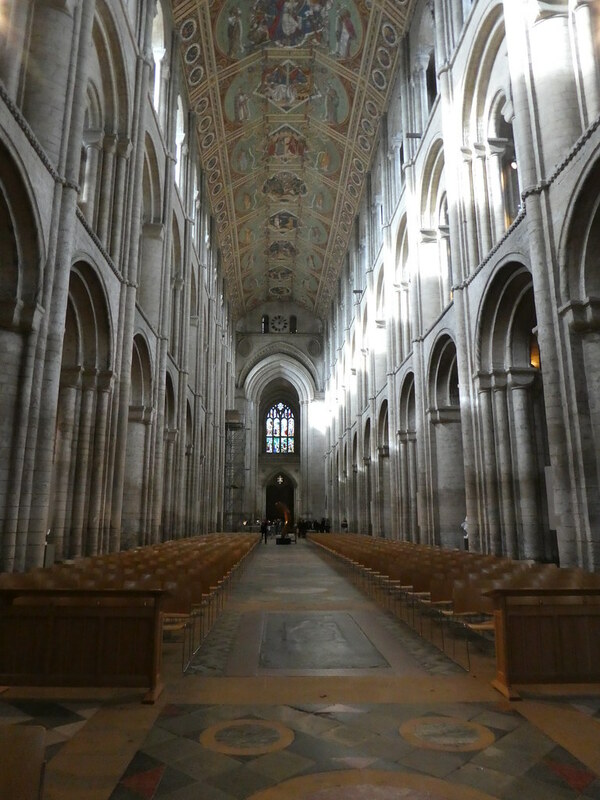 We entered the cathedral through its Great West Door from where we had a view of the country’s third longest nave measuring 75 metres (246 feet). Entrance to the cathedral is £9 or £16.50 to include an Octagon tower tour. It is free to enter the cathedral on Sundays when a tower tour ticket costs £9.50. More information can be found here. 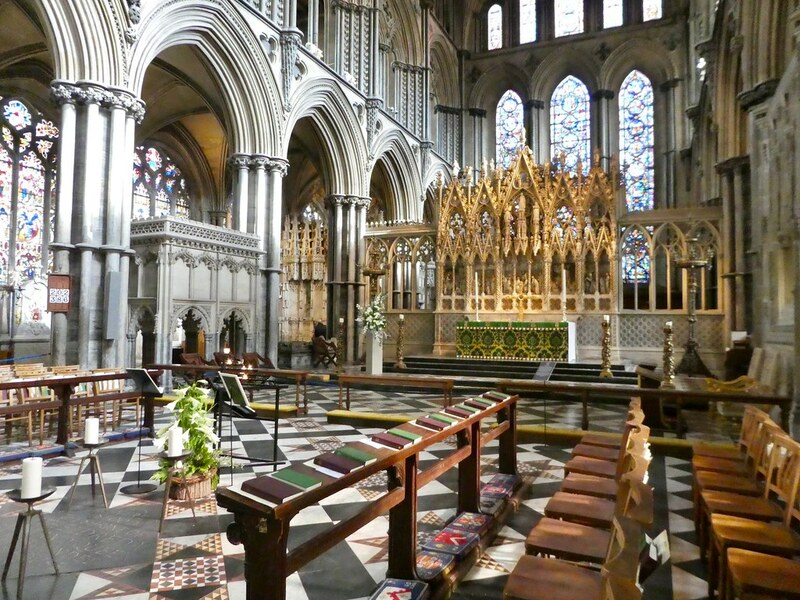 The cathedral originated in 672 when St. Etheldreda built an abbey church. The present building dates back to 1083 and is built in Romanesque style. Its construction is architecturally outstanding both for its size and stylistic details with its most notable feature being the central Octagon lantern tower which is 52m (171 ft) high and 23m (75 ft) wide. We took the tower tour which lasted one hour. Before starting our ascent, we were taken to sit beneath where the lantern hangs and gazing upwards it appears like a great star of light. Our knowledgeable guide then explained about its construction and how it was a masterpiece in engineering of the medieval world. We then began to climb the 170 steps to the top. Firstly, there was a a stone spiral staircase to the gallery level above the aisles and this was where we left our bags for safekeeping before climbing up further. From there, we took another spiral staircase out onto the roof of the transept where we had good views towards the river. After walking along this section of roof we then had to bend down and squeeze through a low doorway which led to a slightly narrower spiral staircase up into the roof space surrounding the lantern. Our guide opened some of the doors so that we could look all the way down to the church floor below. Each of the wooden panel walls of the lantern are beautifully painted with Victorian angels and we were able to gaze down through each of them giving us different views. A final staircase brought us out onto the lead roof around the lantern. We couldn’t have wished for better weather as from this height we enjoyed far reaching views over the stone arches. The lead roof is sloped with ridges but it is quite safe and easy to walk along. After taking photos, we made our way back down to ground level and looked around the cathedral and its chapels before leaving. 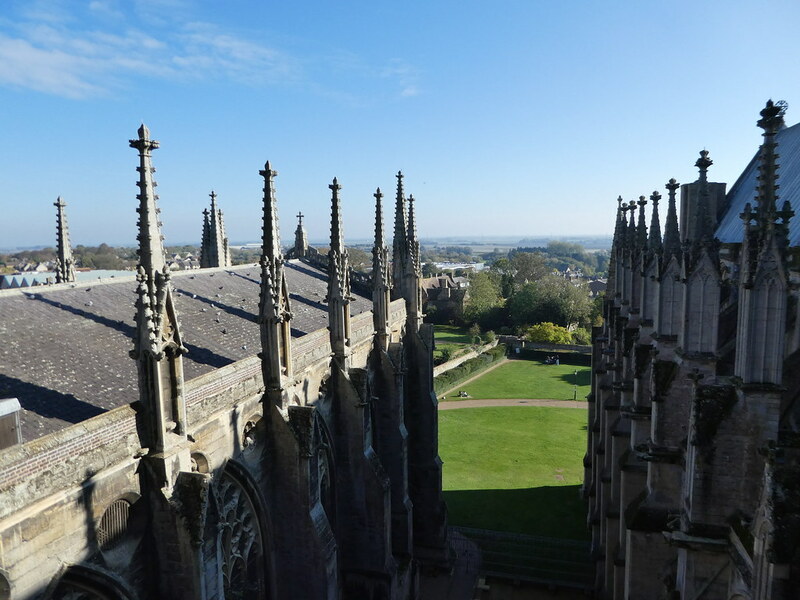 It was a memorable tower tour and I would definitely recommend it, if you are visiting Ely. Leaving the cathedral we noticed an event taking place on the Palace Green and discovered we had arrived in Ely on the day of its annual Apple Festival. We had never been to an apple festival before so we were intrigued to explore this free event and see what was happening. 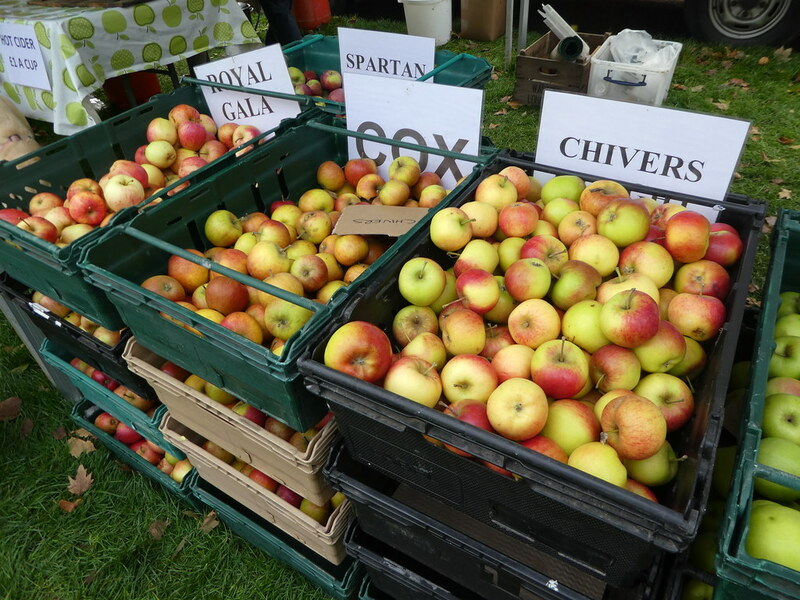 National Apple Day was launched in 1990 and is traditionally held on or around 21st October and Ely has been joining in with the celebrations since 2000. Experts were on hand from the East of England Apple and Orchard Project to identify apples brought along, made easier if people had left part of the stalk and leaves attached. I wish I’d known about this as we have an old apple tree in our garden of an unknown variety. There were several competitions taking place including a contest for the longest apple peel which I was invited to participate in but I didn’t think it would go well so I politely declined. There was also an apple and spoon race and an apple shy to raise money for the town’s Christmas lights. The food stalls all had an emphasis on apples with such offerings as apple crepes and pork and apple sausages. We couldn’t resist glasses of delicious hot cider which we sipped as we wandered around. In one corner there was some traditional Morris dancing which is a type of English folk dance performed in groups and usually accompanied by music. The dancers wear matching costumes and have bell pads on their shins. 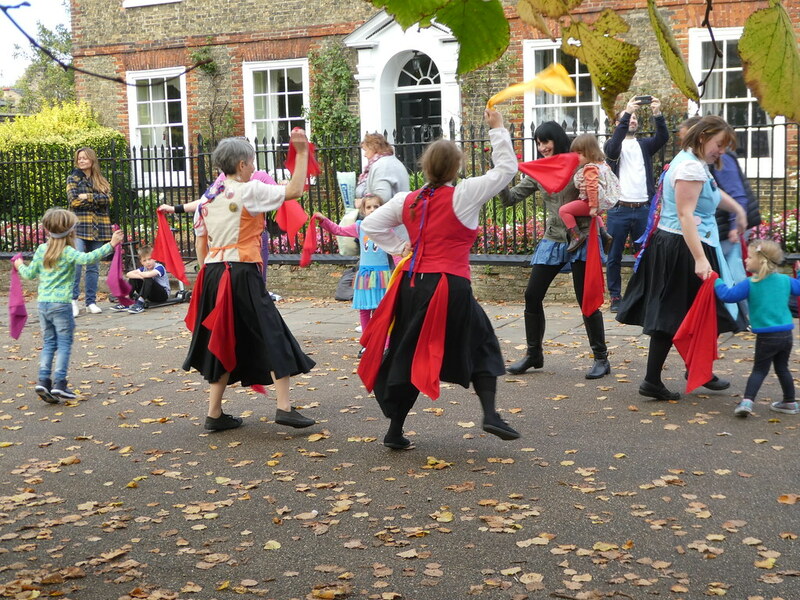 Sticks and handkerchiefs are integral parts of their routines and the dancers can occasionally be seen performing in market town squares and at various country festivals. 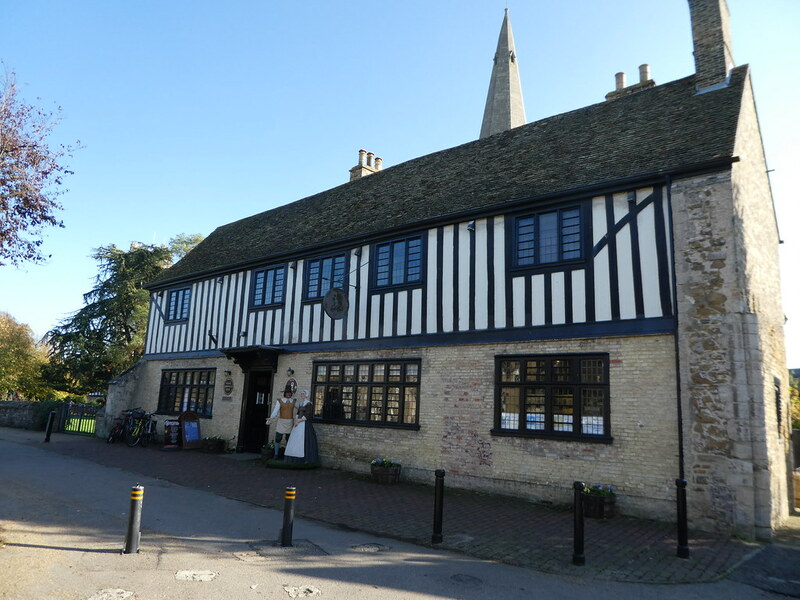 Located near Palace Green stands the former home of Ely’s most famous historical resident Oliver Cromwell. Cromwell lived with his family in Ely for ten years and this house is the only remaining home used by Cromwell with the exception of Hampton Court Palace in London. Visiting Oliver Cromwell’s House costs £5 including an audio guide. 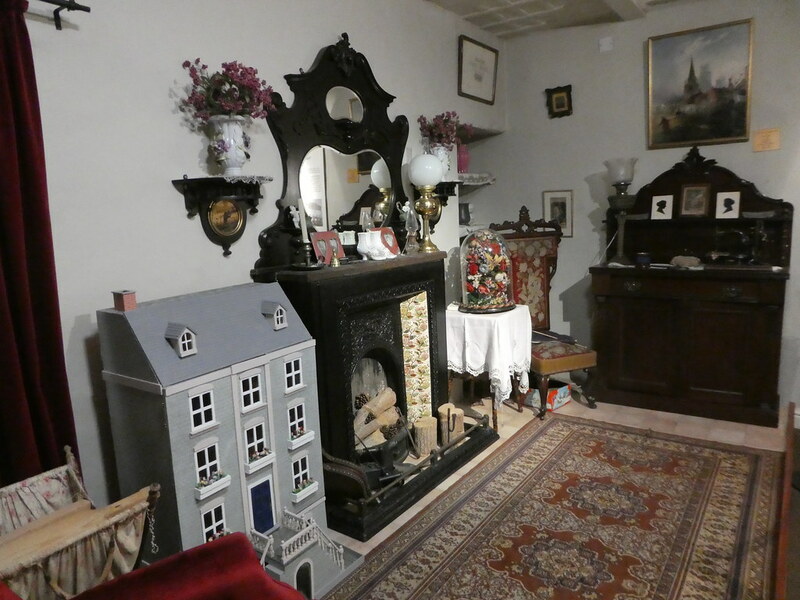 Our self guided tour began with a five minute video to set the scene and then we used our audio guides to tour the house which has been lovingly restored. 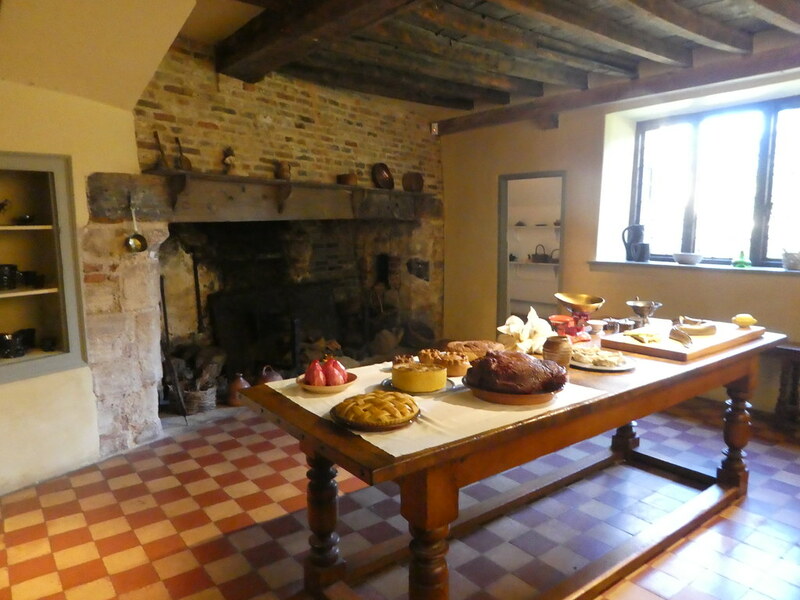 The rooms give visitors a sense of what domestic life would have been like in the 17th century as we explored each of the re-created period settings. One section was dedicated to Cromwell’s role during the Civil War which we found particularly interesting. Continuing our tour of Ely’s attractions, our next stop was at Ely Museum (adult admission £4.50). 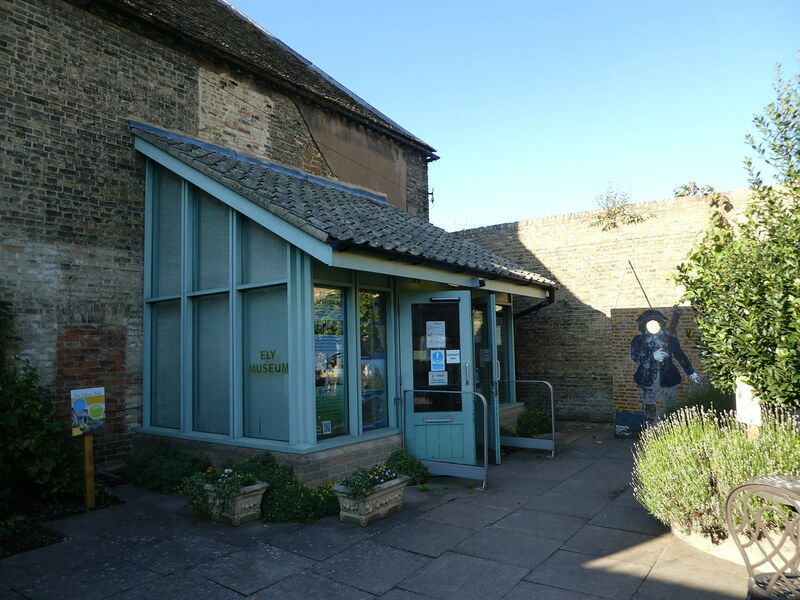 This small museum is housed in one of Ely’s oldest buildings dating from the 13th century. Over the years it has served as a private dwelling, an inn, a registry office and the Bishop’s gaol. Wandering around, it was evident that some of the building’s history remains including prison cells and some original walls. 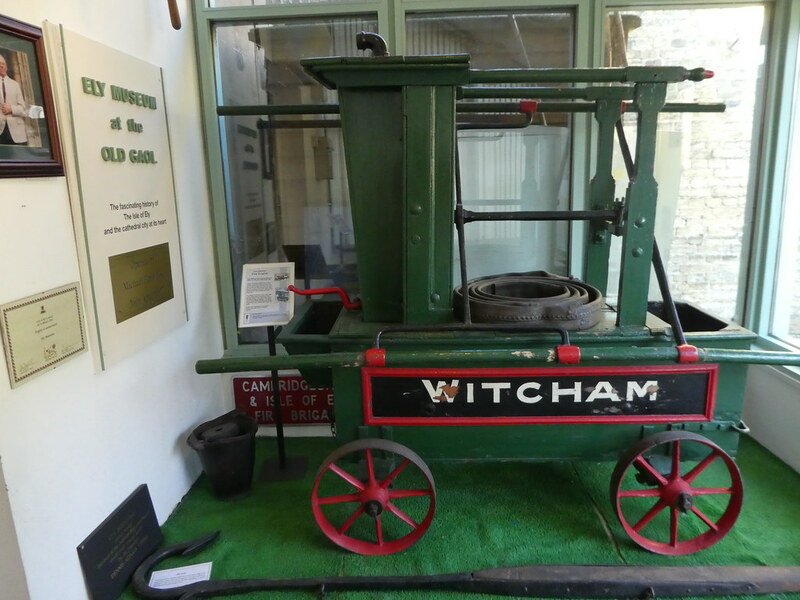 The museum tells the story of the local history of Ely and the surrounding Fenland. It was interesting to discover that Ely takes its name from the Isle of Eels. This dates back to when Ely was an island surrounded by water and marshland. Eels were in abundance and we were able to take a look at some eel baskets which are a type of fish trap specifically designed to catch eels. The eel shaped baskets were made from willow and were often strung together so that several could be caught at the same time. After leaving the museum we wandered through the bustling market and glanced in some of the attractive city centre shops on our way to the riverside. Here we found many people enjoying the late afternoon sunshine, some having drinks on the outside terraces of pubs whilst others sauntered along the picturesque waterfront. Boats depart from outside the Maltings for 30 minute trips along the River Ouse. A board indicated that the next departure on the Liberty Belle would be 10 minutes later so we sat on a nearby bench until the small boat came into sight. Tickets cost £6 and Bob, the Captain was very friendly and welcomed people on board. Before setting off, he gave a short introductory talk about the area, explaining how the Fens were drained and answering questions. Once under way there was an interesting recorded commentary about the city, it’s cathedral and famous inhabitants. It was lovely to view the city from the perspective of the water and to watch ducks and geese paddling along. 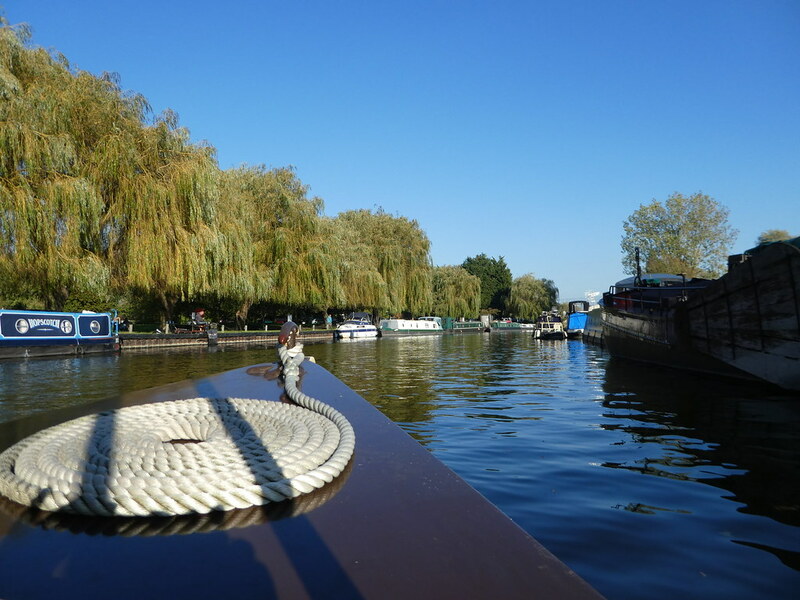 We couldn’t have asked for better weather or for a nicer end to our lovely day out in Ely. The compact city centre is easily walkable and makes for a very pleasant day out from neighbouring Cambridge. Really, I like to watch those so I’ll look out for it, thank you for letting me know and for taking an interest in this post. That)# great, I might have seen it ages ago then and not remembered because I love all his rail journeys and record them for when I have time to view. Hope you have a nice weekend! Thank you so much for your inspiring thoughts. I’m glad you enjoyed this post on Ely. Marvelous, Marion (without the comma as well). Family members from here in the U.S.A. visited Ely this summer in a choir performing at Evensong services in the cathedral. Your photos are terrific and writing insightful. Thanks to your bait, I found myself reading briefly about Cromwell, then Civil War, then the intriguing life of Charles II. Thank you for sharing. Thank you Jason, for your positive thoughts on my day in Ely. I really enjoyed our visit there and the weather was perfect ! Some beautiful shots and interesting history. Thank you, Ely is a fascinating small city with some idyllic scenery. How fabulous. I didn’t know about the tower tour so I missed out. Great photos. Thank you Coral, the Octagon tour was marvellous and an unforgettable experience. So much you’ve shared with us in this blog. The beauty of waterways and buildings was captured so well in picture, It was interesting to see mock ups of rooms as they would have been centuries ago. The fine artwork in the cathedral was beautiful. The old cart reminded me my ancestors from London side made carriages and wheeled vehicles and bought the trade with them to Australia. Thank you for sharing. Thank you so much for your welcome thoughts concerning this post on Ely Ian. Everyone, or almost, has heard of Cambridge but not so many its delightful neighbour. Hopefully, this article may help to bring the city to the attention of more people and encourage them to view its wonders for themselves. What a beautiful cathedral–truly beautiful. Thank you so much for sharing. Take care. 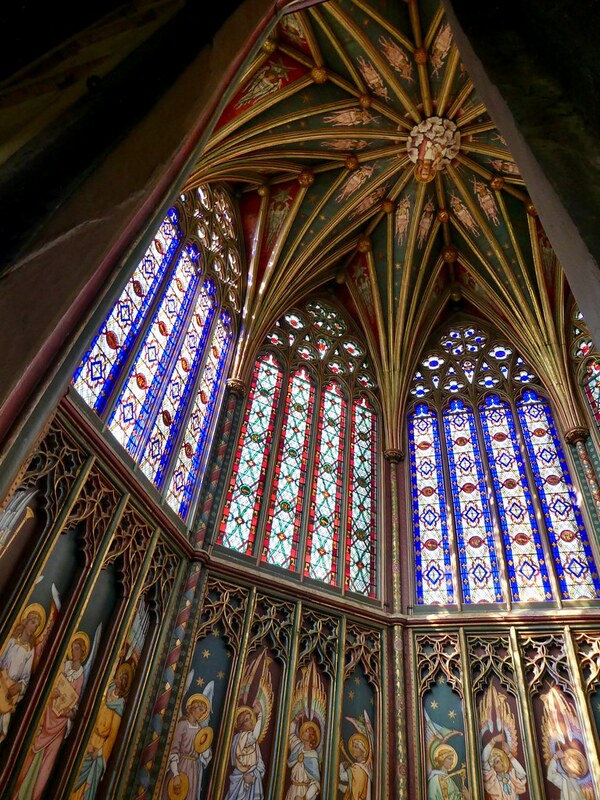 It’s so pleasing to read that you enjoyed this post on Ely Cathedral, it really is absolutely beautiful, especially the Octagon tower. Hi Marion, I didn’t realise Ely had quite so much to see and do, so I think we’ll put it on the list for next year’s holidays. 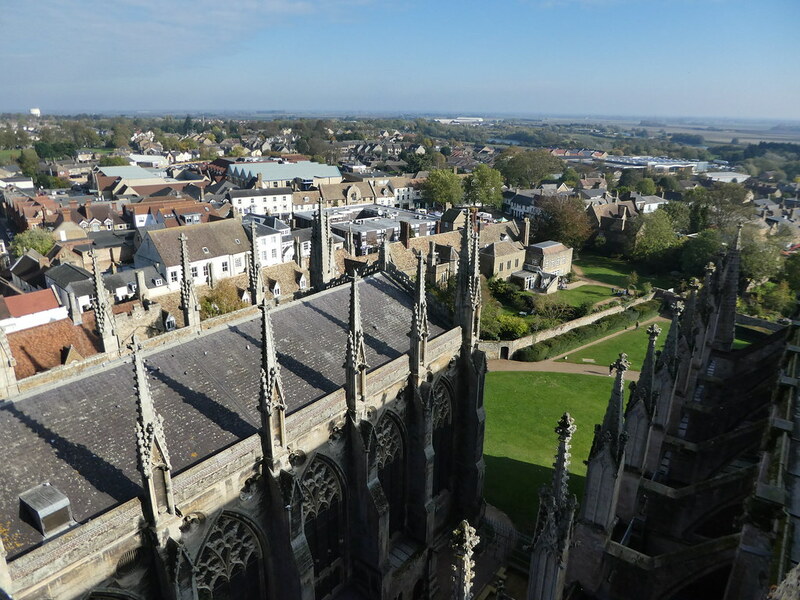 Your description of the tower tour left me feeling uneasy though – I’m scared of heights! But ground-level I’m sure we could manage! Thanks for your much appreciated thoughts Stuart. 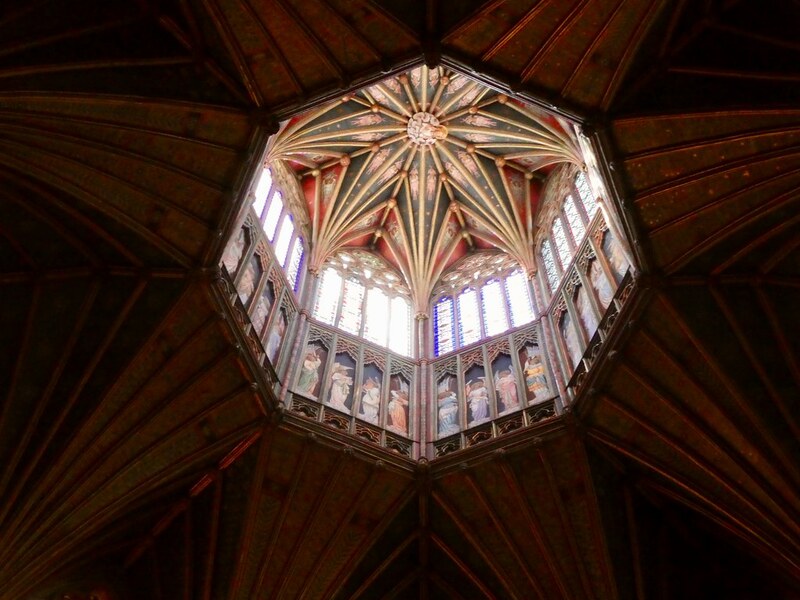 I’m sure you will find plenty to do in Ely without needing to climb the Octagon lantern! We were so lucky with the late autumn weather on this trip. Marion. Ely is a beautiful city, you had such good weather there didn’t you? 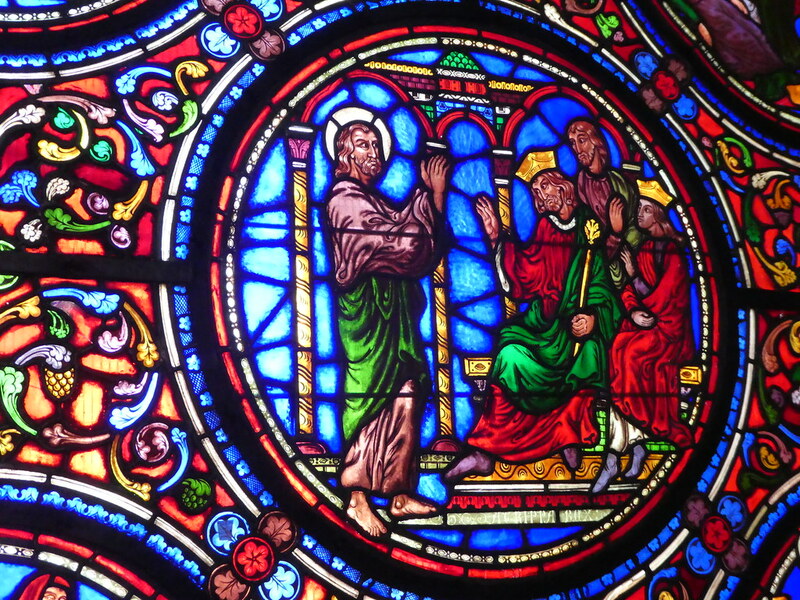 The cathedral is spectacular and well worth a visit, in fact I think we need to try and get back there sometime. Great photos. Thanks Jonno for your kind words. 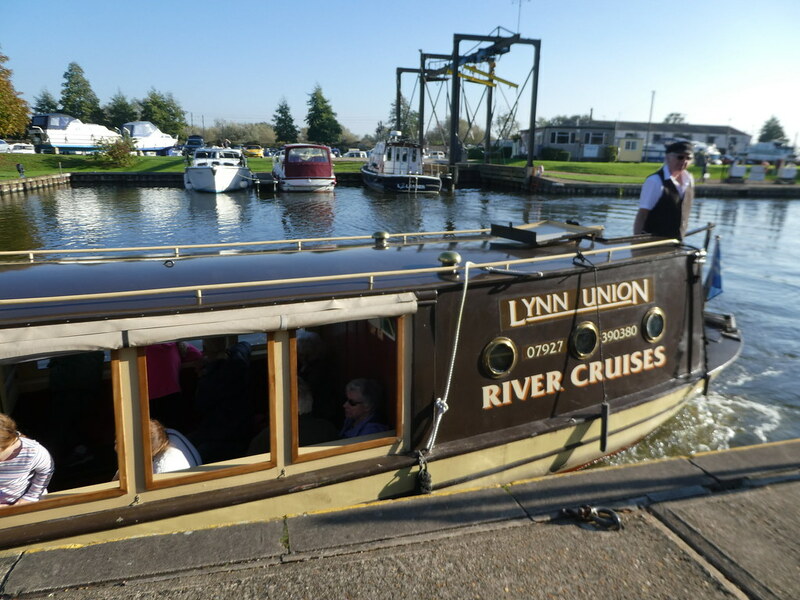 We had a splendid day out in Ely and the weather couldn’t have been better for our visit. Climbing up to the top of the Lantern tower was an unforgettable experience, truly amazing! I’m sure we will return sometime soon! 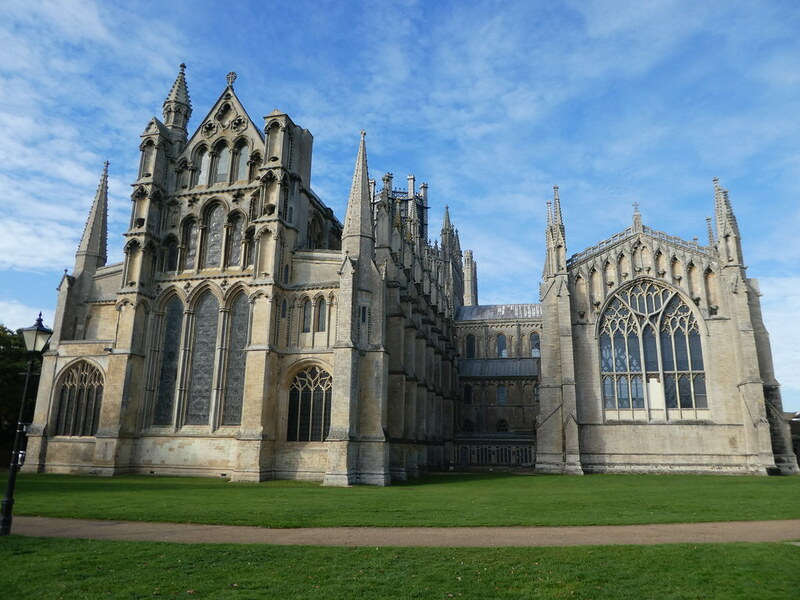 What a great commentary – Ely Cathedral is gorgeous and it looks like you picked a fantastic day to visit! Thank you for your kind words Leanne. Ely Cathedral and it’s lantern tower were beautiful and we couldn’t have asked for better weather! Somewhere else to add to my ever extending list! Thank you June for your kind words. 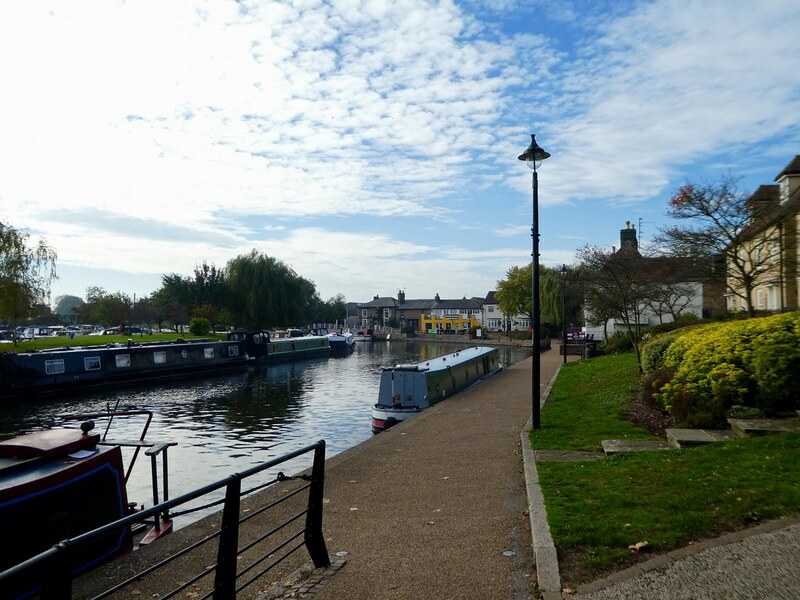 Ely is gorgeous with so many interesting things to see and do. I hope you manage to visit before too long! Yes, Ely was beautiful with so many nice things to see and do, we weren’t bored for a minute and thankfully the weather obliged! Thank you for your welcome thoughts Jo. AH how lovely! I still need to visit Cambridge – and I live so close to it! Can I wish the kitchen at Oliver Cromwell House is mine? So cosy! Thanks Nadine for your kind words. I’m sure you will get to visit Cambridge and Ely before too long and, yes, the kitchen would be great! Thank you for your kind words, it’s so nice to hear from you and to read about your family connections with Ely. Thank you so much for your kind words Simon, Ely and it’s cathedral were beautiful. Now, here, finally, your endless itinerary and my long-ago one coincide. Yes, I saw a bit of Cambridge 45 years ago, but you made more of it than I did, for which I thank you. Ely, though — I’m delighted to have your tour of the Lantern. I looked up at it, but didn’t see it the way you did. Thank you. Nor did I know that Cromwell was a local boy. I regret I didn’t have the opportunity to venture out onto the waterways of the fens, and I’m pleased to see them now. You’re an indominable traveller — or, in American, traveler. Carry on. Thank you so much for your kind words Brad and I’m so pleased to read that you have also visited Cambridge albeit a long time ago. The lantern at Ely was stunning and I would recommend it to anyone as I’ve never seen anything like it. Wow beautiful and interesting place!!! 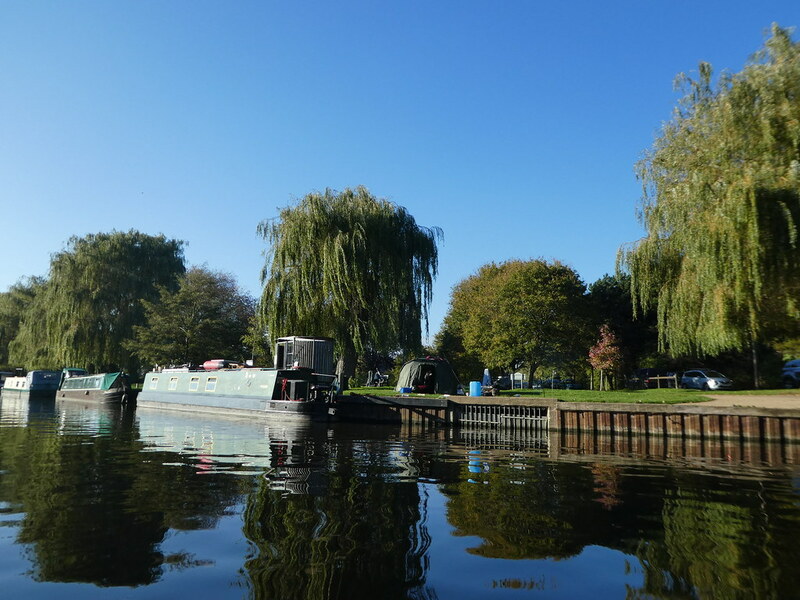 Thanks Emile, Ely is a hidden gem close to Cambridge and well worth a visit.